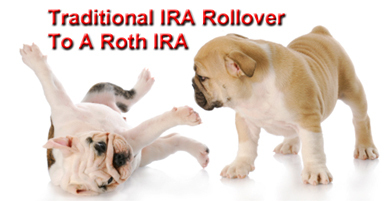 What are the benefits of a Traditional IRA rollover to a Roth IRA? Is it a good idea to convert? And if so, how do you do it? All of the above are excellent questions, and if you're thinking along these lines, then you're already a step ahead of the game. While a number of financial advisors tout Roth IRA rollovers, it's not always a good idea in every circumstance. If you want to know if a Traditional IRA rollover to a Roth IRA is a good financial decision, here's a few good questions you need to ask. 1) Do you expect a lower tax rate in retirement? If you expect a lower income tax rate in retirement, then it might make sense to stick with a tax deductible Traditional IRA. Let's say you're currently in the 35% income tax bracket, but in retirement, you expect to be in the 15% bracket. In such a case, it makes sense to avoid the 35% in income taxes now in favor of paying 15% later. That said, it's hard to predict income tax rates four years from now, much less forty years from now. With record budget deficits, Congress might opt to raise taxes across the board, and that 15% bracket might be much, much higher in your retirement years. So you really have to go with the decision that makes you most comfortable. 2) Have you made non-deductible contributions to your Traditional IRA? If you've made non-deductible contributions to your Traditional IRA, then it's almost certainly in your best interest to perform a Traditional IRA rollover to a Roth IRA. Because if you keep those non-deductible contributions in your Traditional IRA, you owe income taxes on them when you make withdrawals during retirement. If you leave your money in a Traditional IRA, the contributions you already paid income taxes on are taxed again in retirement. 3) Can you pay your tax bill with funds other than rollover funds? If you don't have enough savings to cover the tax bill on your Traditional IRA rollover to a Roth IRA, then a rollover is less advantageous than if you do. Because distributions from your Traditional IRA are only exempt from the 10% early withdrawal penalty if you roll them over (contribute them) to your Roth IRA. If you have to use some of the funds from the distribution to cover your tax bill, then you not only owe income taxes on those funds, but you have to pay an early withdrawal penalty as well. But if you're capable of paying the tax bill with funds from your personal savings, then you can transfer the entire amount from your Traditional IRA to your Roth IRA, which results in a large retirement nest egg growing tax-free on your behalf. How do you perform a rollover? But how do you actually perform a rollover? The good news is that it's a lot easier than you might think. If you use an online broker to host your Traditional IRA, simply follow the online instructions for executing a rollover. Detailed instructions are usually available in the 'Help' section of a broker's website. If you're using a different broker to host your Roth IRA, you'll also need to read the new broker's instructions as well. If you're using a broker that doesn't offer an online presence, simply follow the same course of action over the telephone instead of the Internet. Call up your broker and tell them you want to perform a Traditional IRA rollover to a Roth IRA. They should walk you though the process and assist you with any necessary paperwork. With most brokers, this process is seamless and simple. You probably owe taxes on your rollover. Once you perform a Traditional IRA rollover to a Roth IRA, the odds are better than even that you owe taxes on all, or part, of the rollover distribution. And remember, even if your IRA funds are invested in the stock market, you owe income taxes, NOT capital gains taxes. You do NOT have to pay income taxes on any non-deductible contributions you made to your Traditional IRA. You don't owe taxes on the $20,000 in non-deductible contributions, but the remaining $40,000 is subject to income tax. So, in this case, you owe $10,000 in taxes on your $60,000 Traditional IRA rollover to a Roth IRA. How Will You Pay The Taxes Due? Unless your Traditional IRA is composed of nothing but non-deductible contributions, you'll owe taxes on a rollover to a Roth IRA. How do you intend to pay your rollover tax bill? The answer goes a long way in determining whether or not you should perform the rollover. Because if you're able to pay your tax bill with non-rollover funds, that leaves more money in your Roth IRA growing tax-free and penalty-free for your retirement years. But if you're unable to pay your tax bill without tapping your rollover funds, those funds are NOT available to grow tax-free on your behalf. For instance, let's say you have $40,000 in your Traditional IRA, and you're in the 25% tax bracket. You funded your Traditional IRA with deductible contributions. If you perform a Traditional IRA rollover to a Roth IRA, you incur a tax liability of $10,000. 1) Pay Your Tax Bill With Rollover Funds ? You can use $10,000 of the $40,000 you roll over to pay your tax bill, leaving you with $30,000 to rollover to your Roth IRA. 2) Pay Your Tax Bill With Non-Rollover Funds ? You can use $10,000 from your savings account or another source of non-rollover funds to pay your tax bill, leaving you with $40,000 to rollover to your Roth IRA. Given that there's no annual cap on your personal savings, but there is a $5,000 to $6,000 annual limit for Roth IRA contributions, the more you can rollover to your Roth IRA, the better. Because at $5,000 to $6,000 per year, it's takes several years to accumulate large sums of money in your Roth IRA. So if you get a chance to rollover $40,000 in one year, that's a big advantage. If you have to use money from your Traditional IRA to pay the taxes on your rollover distribution, a 10% early withdrawal penalty is levied on the portion of funds you use to pay the tax bill. In other words, you only avoid the 10% early withdrawal penalty if you rollover those funds into your Roth IRA. Do you see how using rollover funds to pay your taxes can eat into your future retirement savings? A Traditional IRA rollover to a Roth IRA can be of particular benefit if you've made a large amount of non-deductible contributions to your Traditional IRA. Because non-deductible contributions (after-tax contributions) have already been subject to income tax, so they rollover into your Roth IRA tax-free and penalty-free. As a result, contributions which are normally subject to income taxes when withdrawn from a Traditional IRA are no longer subject to future taxation. However, take note that if you have a mixture of non-deductible and deductible contributions, you can't choose to rollover only the non-deductible contributions in order to avoid taxes. For instance, let's say you have $50,000 in your Traditional IRA. $25,000 of that constitutes non-deductible contributions, while the remaining $25,000 is made up of deductible contributions and earnings. What happens if you only rollover half of the funds in your Traditional IRA? Can't you simply choose to rollover the $25,000 in non-deductible contributions tax-free? A $25,000 rollover in this case is taxed on a percentage basis by the IRS as if you had rolled over the entire account. In other words, since non-taxable funds made up 50% of your account and taxable funds made up the other 50%... A partial rollover from your IRA generates an income tax bill on 50% of your distribution. In this case, 50% of the $25,000 rollover ($12,500) is tax-free, while the remaining $12,500 is subject to income tax. So don't fall into the trap of thinking you can take a tax-free partial distribution of just your non-deductible contributions and roll them over into a Roth IRA. If you do, you might get an unexpected and unwelcome tax bill as a result! All of this presupposes that you wait until age 59 ½ to withdraw funds from your Roth IRA. If you withdraw funds early, triggering income taxes and penalties, then you're probably a lot better off avoiding a rollover in the first place. In the end, how you handle each of those factors will determine whether or not a Traditional IRA rollover to a Roth IRA is a good move for you and your family.